The nerve’s power or vulnerability depends on its ability to connect impulse movement—or communicate. In the installation, multiple anatomical-forms are composed of layers that build “trace” of the foot. 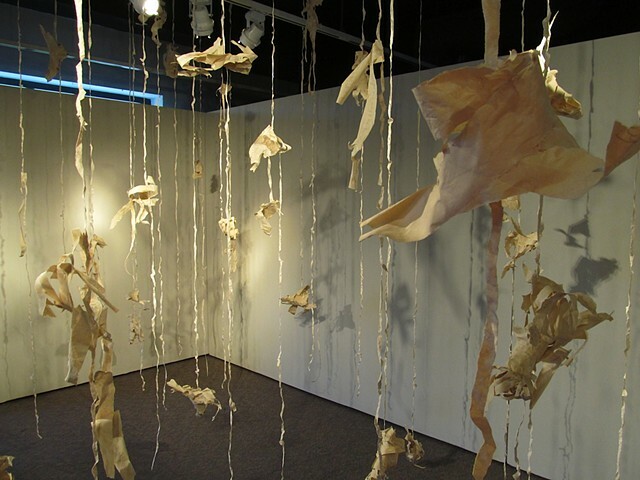 Through using the humble materials of newsprint and adhesive, a delicacy is felt in each object’s empty translucence. In pencil, the interior of the foot-forms contains text from a single postcard sent from Turkey to home and a single postcard sent from home to Turkey. With the repeated action of creating a complete sculpture only to tear through its recognizable figuration, a shift in emphasis occurred. Developing technique with material that supplied visual reward for the viewer became less important than working into the material before it fully dried which would risk the possibility of failure and create an abstraction. It is both the action of the making and the action of the writing, not the recognizability of the body part nor of the words, that suggests there is a limit to both words and images in being able to adequately communicate the experiential.